In this summer's buzziest new documentary, six shut-in Lower East Side siblings stage their own remakes of classic films. Here, they take on Tribeca co-founder Robert De Niro's best. When you’re in the Wolfpack, there are two important rules that Jimmy "The Gent" Conway would definitely respect: know your New York City movies, and do a killer Robert De Niro impression. 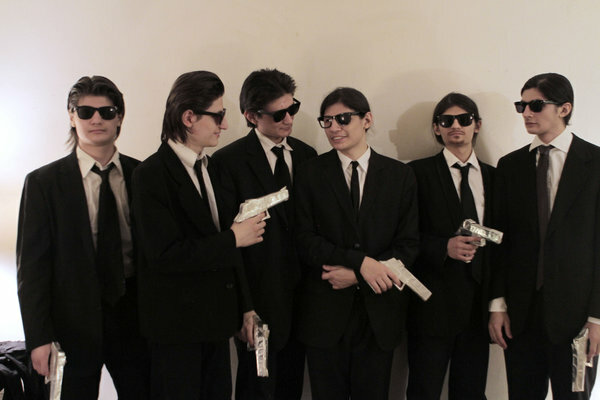 Those rules are applicable to basically every other location and actor in film history, too, but the new documentary The Wolfpack, a Tribeca Film Institute’s TFI Documentary Fund grantee is at its heart, a New York story. It’s an all-access look inside the Lower East Side apartment of the Angulo family, focusing on the six brothers, ages 11 to 18 in at the start of the film, whose father rarely ever allows to step foot outside, due to his fears of the city's crime. To pass the time, the boys endlessly watch movies and stage their own scene-by-scene reenactments, and when they do finally leave home to, of course, go see a movie, they walk NYC's streets in full Reservoir Dogs style. After winning the U.S. Documentary Grand Jury Prize at the Sundance Film Festival in January, first-time director and Tribeca Film Institute grantee Crystal Moselle’s truth-is-stranger-than-fiction doc had its NYC homecoming in April at this year’s Tribeca Film Festival, where the Angulo fellas walked the same red carpet that's been frequented by one of their heroes, TFF co-founder Robert De Niro. Unsurprisingly, the Wolfpack members can all do mean Bobby De Niro impersonations, so the opportunity was too amazing to pass up. Tribeca presents the Wolfpack’s take on select scenes from Mean Streets (1973), Goodfellas (1990), Analyze This (1999) and Taxi Driver (1976), complete with all the necessary F-bombs, tough-guy gangsterisms and hilariously spot-on ’70s-era Harvey “The Pimp” Keitel hairstyles. The results are perfect enough to leave the likes of Paul Rudd and Dave Franco feeling inferior. The bar has officially been raised for all future "You talkin' to me?" references.